This was a good one. It would have made good leftovers too, if I hadn't dumped it all on the floor while transferring it to its container en route to the fridge. Pancha ran right over to help clean it up. You barely need a swiffer with a dog in the house. This, the second recipe I chose from Johanne Killeen's and George Germon's Cucina Simpatica uses dried beans to top pasta again, and again, somehow it works. Also again, I opted not use 4 tablespoons of oil and a stick of butter so as not to undo the health benefits. Instead, I sautéed the veggies in a little oil and didn't stir in the butter at the end. 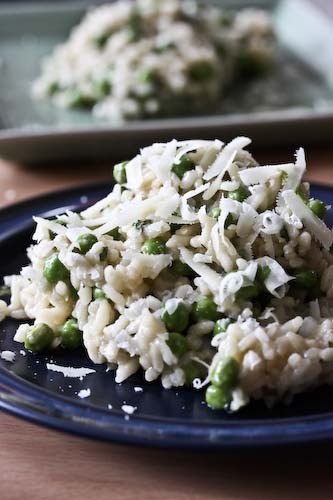 But in case you feel like making this dish a little richer, I'll cue you when to add the extra butteryness in the recipe below. Use as much as you like, as you probably won't outdo the original recipe. One note, although it's called a "spicy lentil sauce" if you actually like spicy, you might consider increasing the amount of red pepper flakes and hot paprika. I'll be using a bit more next time to achieve that satisfying tingle on the lips. Heat some olive oil and a little butter in a 12" skillet and add the fennel, carrot, onion, garlic, salt and red pepper. Sauté the vegetables for 15-20 minutes, until they're soft. Add the paprikas and toss to coat the veggies. Cook for an additional 2 minutes. Add the lentils and 5 cups of water. Bring the water to a boil, reduce the heat and simmer for around 20 minutes, until the lentils are soft but not falling apart. Cook the pasta separately, until it is still quite firm. I love this. I have a couple of bags of lentils that I really need to use. I forgot to get fennel at the farmers market though. 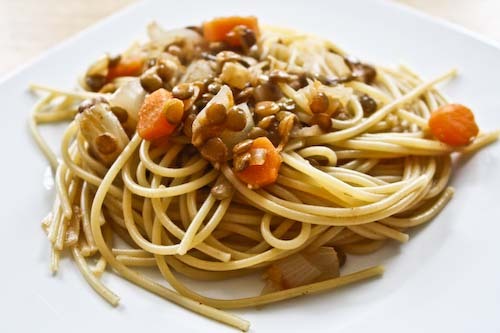 Another pasta-lentil combo that looks delicious! I love the looks of the lentil sauce. Your picture has great lighting, was it near a window? This looks unusual but really tasty! nice. Ooh, BF has made me something similar to this before and it was delicious! And we use wholegrain pasta so it is extremely healthy too! Thanks for reminding me of it, I will have to try this version with fennel. This sounds and looks delicious. Can you tell me though if there are any substitutes for the Hungarian paprikas? I've never seen those around here, just wondering if I could use another spice or normal paprika? Thank you! Thanks Snooky! Do increase the spice if you want it a bit hotter. Esi, you don't absolutely need the fennel if you don't have it, but it's a nice touch. Veggie Belly, my apartment has one window, so to take pictures I set up a little TV tray right under it and hope for a sunny day! Sam, it's definitely unusual, but good! Annie, I've never used wholegrain pasta, but maybe I'll throw it in the cart next time. Can always use a boost in nutrition! Marguerite, you can use any paprika that you have. Hungary is just thought to produce some of the best, most flavorful paprika, in the vein of Italian olive oil etc. Lovely dish. Simple but really filling and tasty. I like using red lentils- they're smaller and better if you like a less earthy taste. They can also be used without soaking and cook quite quickly.